THE US COURT of Appeals last week upheld the conviction of James "Whitey" Bulger, the infamous South Boston gangster and serial murderer now serving two life sentences at a penitentiary in Florida. The three-judge panel unanimously rejected Bulger's claim that his trial was unfair because he wasn't allowed to tell the jury that a top prosecutor had long ago promised him immunity for any crimes he might commit, up to and including murder. Bulger provided no evidence that he had been granted any such immunity, and the federal official who supposedly authorized it died in 2009. But evidence wouldn't have mattered anyway. Government officials cannot give criminals permission to murder with impunity. Any deal purporting to do so would be unenforceable in a court of law — utterly contrary to public policy, and therefore null and void. As the first trial judge in Bulger's case, Richard G. Stearns, bluntly ruled: "A license to kill is even further beyond the pale and one unknown even in the earliest formulations of the common law." 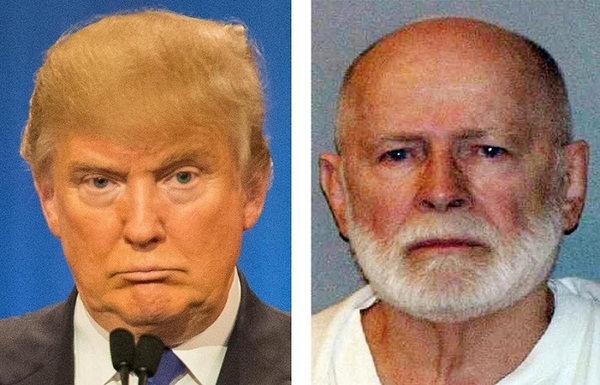 It's unlikely that Trump takes any interest in Bulger's legal proceedings. But there's a lesson for the presidential candidate in the unequivocal rejection of the argument that a government official authorized Bulger to commit violent atrocities. Prosecutors have no power to green-light savage criminal behavior. Presidents don't, either. Trump has been busy in recent days, zanily "evolving" his stands on assorted hot-button topics. In the space of just a few hours last Thursday, for example, he claimed to be strongly against issuing more H-1B visas for skilled foreign workers, then said he was strongly in favor, then decided he was strongly against after all. That's not the only subject on which his positions have been lurching. Trump has promised that as president he would seek not only to kill terrorists, but also to "take out their families." He has gone beyond enthusiastically embracing the use of waterboarding by US military personnel, and endorsed torture methods that are "a hell of a lot worse." Such acts are wholly illegal; any US troops who committed them would be guilty of war crimes. If Trump became president and ordered such behavior, former CIA director (and retired four-star general) Michael Hayden has warned, "American armed forces would refuse to act." When Trump was asked during the latest Fox News debate what he would do if US troops disobeyed his illegal orders, his reply was menacing. "They won't refuse. They're not going to refuse me. . . . If I say do it, they're going to do it. That's what leadership is all about." Trump appeared to walk back those remarks the following day, telling reporters that he would "not order a military officer to disobey the law" and acknowledging that he would be "bound by laws just like all Americans." Yet by Saturday, he had found a way to walk back his walk-back: a promise to legalize torture. "We're going to stay within the laws," he told a Florida rally. "But you know what we're going to do? We're going to have those laws broadened." Trump's unfitness for democratic office manifests itself in many ways, none more disturbing than his belief that there is no moral limit to power. He seems never to have heard of the Nuremberg Tribunal, or of the principle that an order to commit war crimes must be refused. It may come as no surprise that a hardened criminal like Bulger would argue that brutal murders can be cleared in advance by a government official. But it's scary to hear a would-be president talk the same way. Scarier still that so many voters find such authoritarian demagoguery appealing.